“When the moon hits your eye like a big pizza pie… That’s amore“. This 50’s era hit is one of my favourite songs when doing karaoke. I always manage to get a good laugh out of my audience belting out this Italian American classic at the top of my lungs. I’ve always told myself they laugh at the incongruity of it all, but it’s more likely they’re laughing at my bad singing. In the second verse, there’s a mention of Pasta Fazool, and I’ve always wondered what it is that made the songwriter drool. Getting me to sing requires copious amounts of alcohol though, and the last thing I’m thinking about the next morning is to Google “pasta fazool”, so it’s long remained a mystery. That is, until last month, when Stacey from Stacey Snacks posted about Pasta e Fagioli (pasta and beans), which is the proper Italian name for this dish. Mystery solved! This month, Susan from Sticky Gooey Chewy Creamy is hosting Dinner and a Movie, and she chose Moonstruck. I’d never seen the movie before, so I watched it last night and as soon as I heard That’s Amore in the opening sequence, I knew exactly what I wanted to make. 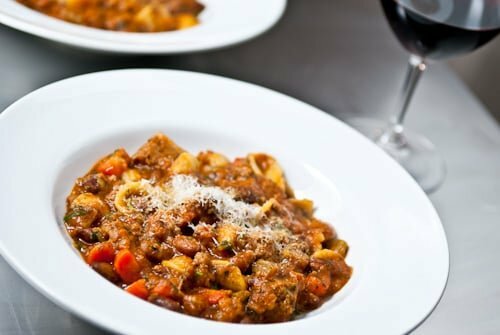 Pasta e Fagioli started out life as a meatless peasant dish, and like many of the other peasant dishes I’ve posted in the past, there are as many variations as there are cooks that make this dish. Apparently in some dialects of Italian, fagioli is pronounced “fazuːl”, which explains why it’s known as Pasta Fazool here. For my version, I wanted to strike a balance between the old world and new, so I’ve used the traditional borlotti beans, but I’ve also added meat to the peasant classic. It all starts off with a basic soffritto, which lays down the base layer of flavour for this stew (as well as most stews for that matter). Then, stock, tomatoes, meat, and beans go in until the beans are tender and the whole thing is a thick hearty consistency. It’s finished with some short pasta and in this version I’ve used orecchiette. In keeping with old world traditions of letting nothing go to waste, the meat in this one is leftover meatloaf and I’ve also added some Parmesan rind to impart its nutty flavour into the stock. If you are using uncooked meat such as pancetta or Italian sausage, brown them first, transfer to a plate, then use the fat they release to make the soffritto. If you are use precooked meat or are making this vegetarian, add a generous splash of olive oil to a stock pot (about 2 Tbs). Fry the ingredients for the soffritto until soft and about halved in volume. This process deepens the flavour of the soffritto (aka mirepoix) through a Maillard reaction, which causes sugars in the veggies to react with amino acids to form new flavour compounds. Add the vermouth to the soffritto and cook until there is no liquid left. Add the chicken stock, chopped tomatoes, beans, Parmesan rind, basil, bay leaf and thyme. Allow this to simmer uncovered until the beans are tender (about 1 1/2 hours). If the soup start getting too thick, add a bit of water and continue cooking with a lid. 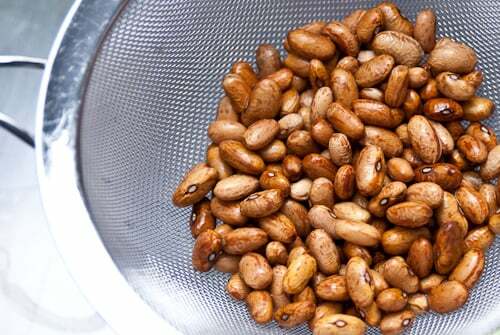 When the beans are tender, taste for salt and add more if needed. Add the pasta and cook until tender, you may need to add a bit more water if the pasta absorbs too much. 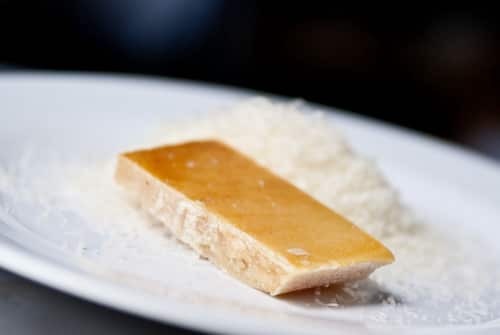 Serve with bread and a generous dusting of freshly grated Parmigiano-Reggiano. Since when are you from New Jersey? (“fazool”!). Fazool! I love! The soup looks lovely, almost like a ragu. I, too, love using parm-reg rinds in soups, it really adds such depth to the flavor. I can not belive that you have not seen Moonstruck before! As Stacy said “Snap out of it!” I did not even watch the movie to make my post because I know it so well. As always it looks great! I love beans, tomatoes and stock. I, too, had always wondered about pasta fazool because of that song lyric until I saw the post on Stacey Snacks too. Looks great! Not sure that I’ve ever had this pasta – it looks excellent! Dare I say “YUM!”?…Marc this is absolutely wonderful. The addition of the meat is fantastic and really adds a hearty touch to the dish! Looks fantastic…although EVERYTHING you makes looks fantastic! nice fazool 🙂 my brain continues to fail in fulfilling the concept of eating more vegetarian, and likes the meat addition. This pasta looks awesome! Very elegant, yet simple. And I love using beans in pasta– will have to give it a try!! you go marc, get your I-talian on. your fazool looks darn good for a ‘merigan’ – my grandma would be proud of you. There are so many versions of pasta and fagioli. Yours looks similar to what I grew up with. We were recently in Padua (Padova) Italy and they eat it very differently – almost pureed with very little chunkiness and no, or little meat. Both ways are delicious. 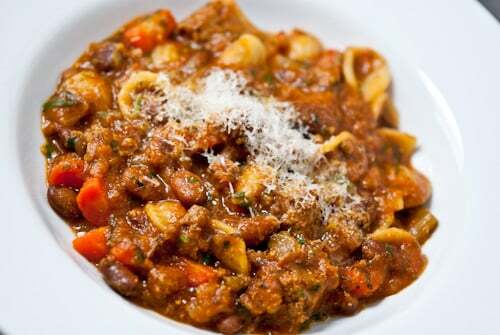 Pasta e Fagioli is a dish from the Veneto region of Italy, in the north/east, where Venice, the town I am from, is located. Thanks for making this dish, it is very typical of Venice, mostly vegetarian, sometimes with a piece of pork bone added. I want to stuff this into my face. How many people does this recipe serve, I wonder? Looks and sounds great! Thanks for all the explanations, too! !Greatly appreciated. You should be able to get 6 small portions out of this (it’s heavy so you don’t need a ton). It’s easily doubled though and it should freeze well if you have leftovers. Marc, a good rib-sticking dish…very hearty indeed. Some homemade bread and a Chianti is all I need here. I love this recipe and make it all the time. One bone of contention, though: The vegetables in soffritto and mirepoix undergo caramelization, not the Maillard reaction. Mama never put wine in the pasta é fagioli. She made what you call the soffritto (she called it the batutto) with the above ingredients and pancetta or salt pork. Never stock. Only water. For the pasta? Always tubetini! I make it the way she taught me, and it takes me years back right to her cucina!